This “Daan utsav” lets quench the thirst of as many as we can and take their blessings as nothing in this world can take the place of water ???? ..स्वच्छता का रखा करिए ध्यान, इससे बनेगा देश महान. आओ मिलकर करे यह काम, स्वच्छता का चलाये अभियान. अशिक्षित को शिक्षा दो,अज्ञानी को ज्ञान. शिक्षा से ही बन सकता हैं,भारत देश महान. Knowledge is power and books? are the true friends for life ..this “ Daan Utsav”, let’s give this friendship gift to our little learners ..we are setting up a library for students of Tiljala school..
All kinds of story books ? and educational books ? ( new or old) are welcome ! 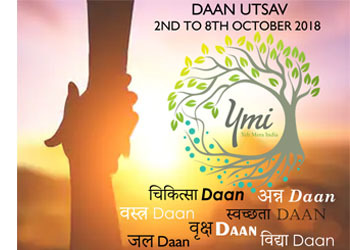 This “ Daan Utsav “, take a step towards healthy India …a health check-up will be organized for the children of Lovelock basti by eminent doctors with the complete follow-up… let’s come forward and donate this wealth of health to our future .. This “Daan Utsav” lets give new clothes to the little avatars of Ma Durga and make their pujas more exciting than ever ..
अपना सच्चा धर्म निभाए, पेड़ बचाकर कर्तव्य निभाए..